Both my parents were teachers - maybe that's why I am one, and my sister also. Perhaps I had no choice. In some ways they are my role models for my teaching career. My Dad was a school principal - he taught in many different schools in the Upper North Island. He was an innovative teacher in his time. 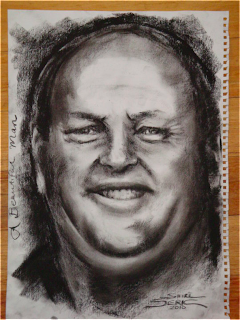 He taught at East Tamaki Primary in Otara, Bruce McLaren Intermediate (Henderson) and Hay Park Primary (Mt. Roskill) to name a few. He set up reading programmes for families who had few books in their homes; he was available to talk to parents 24/7 and he tried his best to ensure that the best teachers were in front of the students in his care. Dad always got to work early and stayed late to ensure the schools he was in charge of were safe and the students were too. We often went as kids to the school fairs and I loved seeing how popular he was with the kids he worked with. He had an infectious laugh and even at a school fair with thousands of people there I could always find him laughing with a parent or a student. He also had a crazy handshake - so strong - it almost pulled your hand off - we try and replicate that in my family now but never as strong or as long. He always told me make your vocation your vacation - not sure who said this originally but I do take this on board - no point going to work every day and hating it. Love your job I say - you're a long time doing it so best to have fun and enjoy your job. I like this quote "Nothing is really work unless you would rather be doing something else" by Jame Barrie - so true. Despite th is strong work ethic, Dad always had time for me and his other kids. He came to nearly all of my hockey games (cheering me on from the sideline); drove me all around Auckland; took me on holidays and spent many hours with us kids up in the Bay of Islands. I wish this for myself - I hope my kids think that I don't spend all my time working but spend time with them doing fun stuff as well. My Mum was also a teacher. She retired about 11 years ago to look after my daughter full time when I went back to work. She was also a school principal but in a school for students with special needs. She cared hugely about these students who had so many physical disabilities often unable to show their mental abilities as they were so disabled. She worked tirelessly for these children and their families - and eleven years later she still keeps in contact with many of the families she worked with. She loved working and was a real inspiration for many of her staff. I admired her enthusiasm and efforts she put in even when she did not win the battles - sometimes though she won the war. She would have loved to have been in teaching, with ICT in the mix - somehow she would have battled to ensure that all the kids at her school would have had access to the most up to date hardware to ensure they could communicate with everyone and that they could maximse their learning. I try to do this with my students who though not disabled, need help to learn and ICT can be the vehicle to do this. 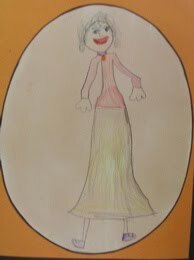 My daughter drew this picture of her Pammie five years ago - it's gorgeous. And quite a good likeness!